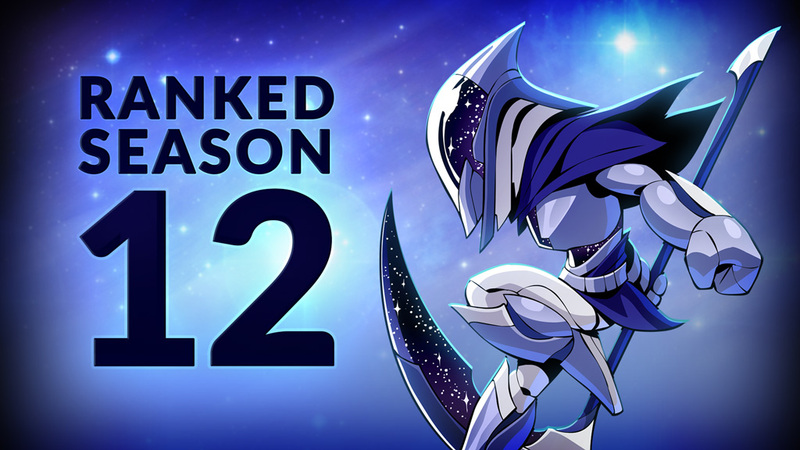 This week is the start of the new Ranked Season 12! We’re also continuing our Luck o’ the Brawl festivities with daily bonus Gold, Lucky Clover Colors, and more. Additionally, this week we’ve updated the Brawl of the Week, changed items on sale in Mallhalla, and updated what Legends are on the free-to-play Legend rotation. To catch the latest Brawlhalla news and content, be sure to follow us on Twitter, Twitch, Facebook, YouTube, and Instagram! Season 12 – Rewards and Soft Elo reset! If you’re new to Seasons, here’s some information you should know. You’re going to have a soft Elo reset and will also receive Glory, the currency you receive for playing Ranked. You can use it in the Ranked section of Malhalla to get special Colors and Weapon Skins to show your dedication to your favorite Legend. We hope you enjoy your rewards and enjoy the New Season! Soft Elo Reset is based on your current Elo at the end of the season. 2v2 Team & Legend Ratings have been brought closer to 750. Over 2000, we aggressively brought you back down as a way of resetting the top tiers. Diamond level players will be reset to high gold or low platinum. Glory earned is based on a combination of your Highest Peak Rating (highest 1v1, 2v2, team, or Legend rating/Elo) and total Wins. This was designed in order to reward both skill and dedication for those who pursue Glory. You gain 20 Glory per win up to 150 wins, which gets you 3000 Glory. After 150 wins, each subsequent win gives you slightly less. Note: There is a minimum requirement of 10 games played to be eligible for Glory based on your rating. If you placed in Gold or better in your best rating, you are given a ranked border that people will see in the match preview screen. There are Ranked borders for Gold, Platinum, and Diamond tiers. These will last for one season and will be updated again after the new season comes to a close. Your border from any previous season does not carry over or have any impact on your current border reward. Ranked Avatars include prestigious versions for those who’ve placed in high ranks during previous seasons. For example, if you placed in Platinum last season and Gold this season, you’ll receive the upgraded versions of the Competitor’s Badge and Gold Emblem. You will still have your original Platinum Emblem avatar from previous seasons. You must play a minimum of 10 games to receive ranked avatars / borders at ANY rank. Competitor’s Badge: Awarded to anyone who plays 10 Ranked Games or more. Gold Emblem: Awarded to players who finish at Gold or above. Platinum Emblem: Awarded to players who finish at Platinum or above. Diamond Emblem: Awarded to players who finish at Diamond. Upgraded versions of Ranked Avatars are awarded to those who have earned the same Avatar in any previous seasons. For players who have reached the 5th Tier of an avatar by reaching a certain rank or higher for five total seasons: the 5th Tier of that avatar will stay in your inventory permanently! Congratulations on your achievements! The 6th Tier Avatar, for those who have reached a certain rank or higher for six total seasons, will take on a brand new look! These avatars will grow more and more prestigious with each subsequent seasonal repeat up to Tier 10, at which point the Tier 10 avatar will remain in your inventory permanently. In short, every 5 Tiers of avatars, you’ll keep the most awesome, most decked out version permanently, and then start work on a new version for subsequent tiers for 6-10, 11-15, and so on. Beyond glory there is immortality! Goldforged color scheme is only purchasable with Glory and requires the Skyforged color scheme of that same Legend to have already been purchased. Queue solo or as a team for 3v3 brawlin’ action! No partner? Don’t worry, we’ll find someone to fight with you! No team damage, no ladder anxiety, just relax and enjoy Brawlhalla in teams. First team to KO each opponent 3 times wins! Follow the lucky clovers to find the Luck o’ the Brawl goodies. The Outlaw and Forgeborne Chests are available with exclusive Skins for a limited time. Check out the new Sales items! 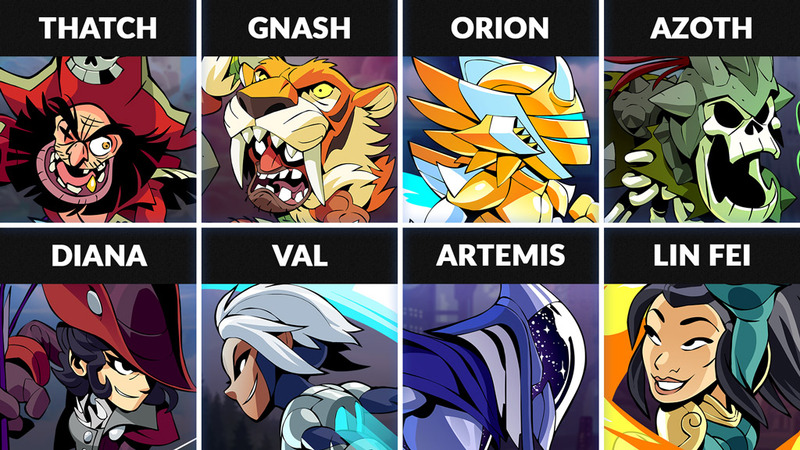 The new Legend rotation for this week includes: Thatch, Gnash, Orion, Azoth, Diana, Val, Artemis, and Lin Fei. Thatch – The tournament is a paradise of chaos and fire for this Madman of the Barbados as he uses Sword and Blasters. Gnash – In the darkness, before the dawn of history, this Legend was raised by the harsh jungle itself. This Super Hunter uses Grappling Hammer and Spear in battle. Orion – A revered warrior and champion, the mysterious armored knight uses Rocket Lance and Spear to battle his foes in the halls of Valhalla! Azoth – Devoted acolytes bring this brilliant and ruthless lich lord to life as he comes into Valhalla to do battle with Bow and Axe. Diana – Commander of the Order’s hunters, she uses her Bow and Blasters to slay countless beasts and monsters. Val – An android assassin with terrifying strength and quicker-than-light cognition, Val is a force to be reckoned with when utilizing her Sword and Gauntlets. Artemis – Transversing the universe in search of her rival Orion, Artemis has ripped open a wormhole into Valhalla, armed with a Rocket Lance and Scythe; she is ready to fight! Lin Fei – A defender of the innocent and teacher of the lost ways. She is a great teacher who has developed her own fighting style, the ‘Way of the Iron Dragon,’ which utilizes her Cannon, Katars and an ancestral dragon-spirit.